The violence involved Amhara and Qimant communities but authorities claim that it is a proxy skirmish for the two people have nothing to fight about and have lived together peacefully for generation. TPLF is implicated in the conflict. 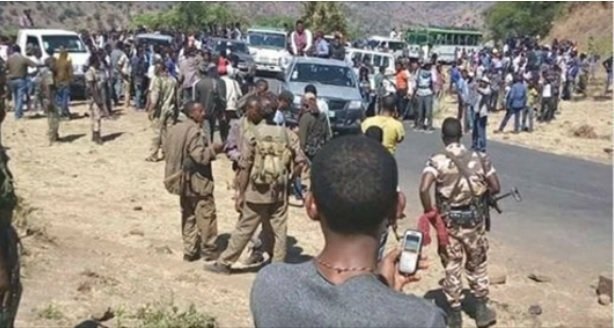 Allegedly renewed proxy skirmish involving Amhara and Qimant communities in Chilga, central Gonder, left several civilians dead and two kebeles (local administrative units) are annihilated. As well, there are reported kidnappings and plunder. Thousands of residents in the area are displaced. Amahra regional state has issued a statement today condemning perpetrators of the violence. Ethiopian Satellite Television (ESAT) cited peace and security head of the region, Brig. Gen. Asamenew Tsige, who confirmed that several civilians are killed and houses burned in Aykel and Guang areas of Chilga zone, to report that the recurring skirmish is a proxy one. According to General Asamenew, Tigray People’s Liberation Front (TPLF) is arming and financing groups who are operating in the name of Qimant, a community in Gonder region which speaks the same language as the rest of the people in Gonder region and beyond. Heavy weaponry including artillery is believed to have been smuggled to the region and the groups destabilizing the region, as authorities from the region confirm, are employing them in their armed operations. TPLF has not responded to the allegation yet. In a statement, which is published by Amhara Mass Media Agency (AMMA), the region’s Communication Director, Asemahegne Asres, says the violence in Dembia zone of central Gonder region represents neither Amhara nor Qimant communities. He added that several suspects are in custody in connection with the incident and there are also others who are not still in custody to whom arrest warrant is issued. He did not specify the number of causalities. According to Asemahegne, the latest string of violence in the region was triggered when the 24th division of the Defense Force deployed in the region withdraws from the area and the 33rd division taking over the task of restoring and maintain calm in the region. Organized groups, in the words of the communication director of the region, launched an attack on the Defense Forces. The statement did not make it clear if the 33rd division was involved in counter-offensive.